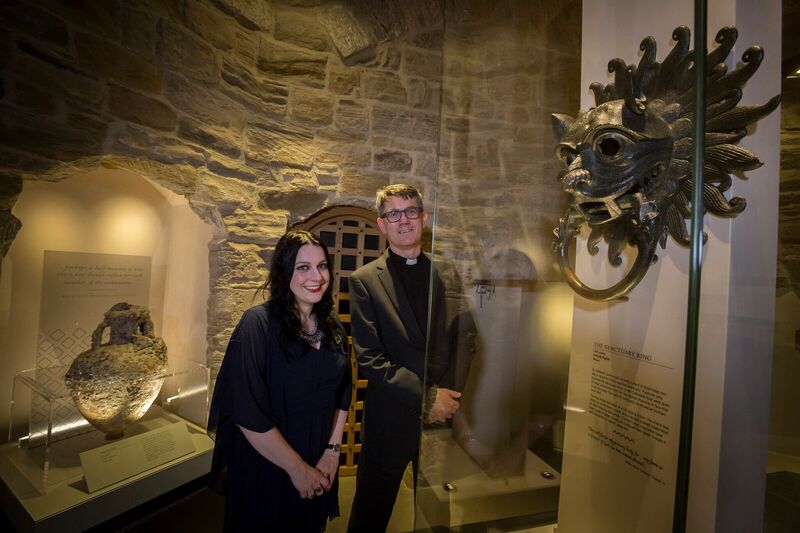 JONATHAN JONES visits the wonderful Treasures of St Cuthbert that are finally back on display at Durham Cathedral in a superb new setting that drew audible gasps at the official unveiling. 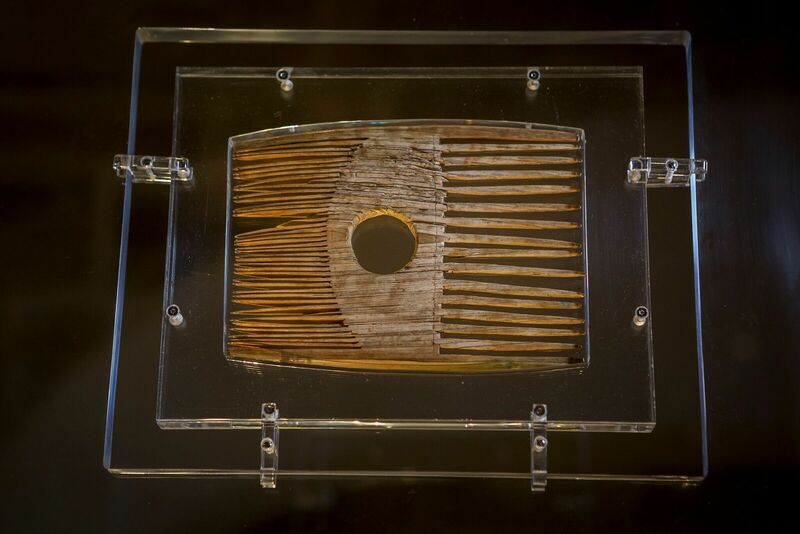 Anglo-Saxon artefacts, dating back more than 1,300 years, and belonging to monk, bishop and hermit, St Cuthbert, have gone back on display in Durham Cathedral. The relics, including the coffin in which St Cuthbert’s body was carried from Lindisfarne, to its final resting place on the site of Durham Cathedral, and the gold cross he wore around his neck, are the centrepiece of The Treasures of St Cuthbert, which opened to the public at the weekend. The relics were described as the “Tutankhamun” of the North-East, by cultural historian and Anglo-Saxon specialist, Dr Janina Ramirez at the official launch of the exhibition. She admitted that the excitement of seeing the relics, back in their rightful home, in a purpose-built exhibition inside Durham Cathedral, had made her unable to sleep the previous night. The ornately carved coffin, featuring runic and Latin inscriptions, is rightfully, the centrepiece of the exhibition, and is regarded as the most important surviving relic from before the time of the Norman Conquest. Images of Christ, the Virgin Mary, apostles and archangels are still visible on the incredibly preserved oak fragments, and brought audible gasps from the clergy, scholars, officials and journalists gathered to witness them for the first time in their new home, in a specially developed exhibition space inside the cathedral. 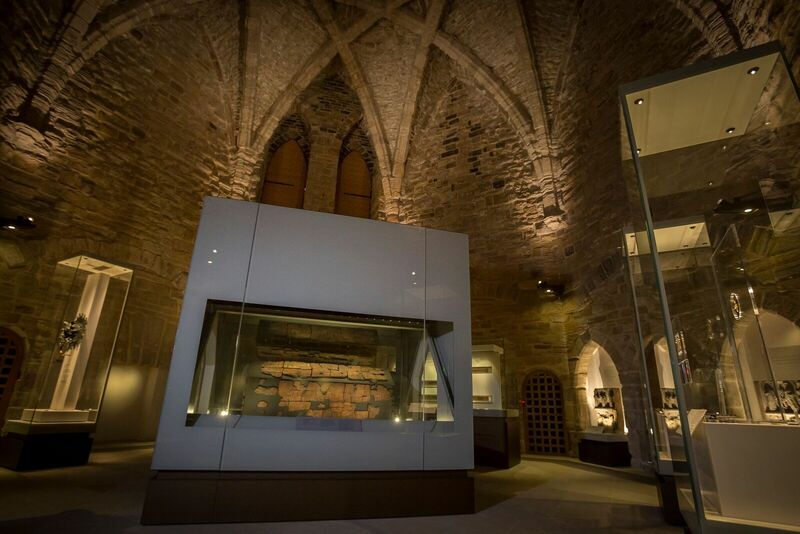 The coffin of St Cuthbert forms the centrepiece of the permanent exhibition in Durham Cathedral’s Great Kitchen. Dr Ramirez said: “Some people think that there is a time in the history of Western Europe when the lights went out – when the civilisation and refinement of the Roman Empire was replaced by a Dark Age, visible to us only through a glass darkly; through scraps of archaeology, fragments of enigmatic text, and the bones of early medieval people, who walked a thousand four hundred years before us. The exhibits are housed in the Great Kitchen, which has been transformed into a world-class exhibition space, following a year of environmental monitoring, to ensure the relics are kept in the right conditions to ensure their continued longevity. The project has seen the construction of purpose built exhibition and gallery space in the Cathedral, with access to the treasures themselves being monitored at all times. Indeed, access to the space itself, felt more like entering the Star Ship Enterprise, than the stone walls of the Cathedral. Visitors were beckoned into a chamber, through which they could see the artefacts beyond another door. Once the environment was stabilised, the inner door opened, granting access to view the fabulous treasures, in glass cases that only enhance their true beauty. The relics of St Cuthbert, previously on display in the Cathedral’s undercroft, have been in storage for the past six years, during the main phase of the project. The creation of this space, marks the completion of the Cathedral’s £10.9million investment in the Open Treasure project. The project has been generously supported by a £3.9 million grant from the Heritage Lottery Fund. 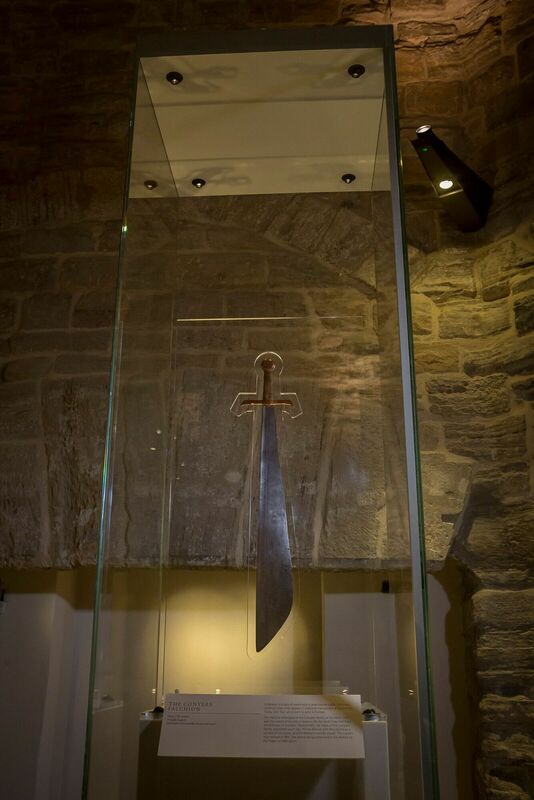 The Conyers Falchion, a medieval sword, used in a ceremony for newly appointed Bishops of Durham, is another highlight of the exhibition. But perhaps the final word should go to the Dean of Durham, The Very Reverend Andrew Tremlett. He said: “It is very fitting that the final jewel in the crown of Open Treasure is centred on St Cuthbert, in whose honour Durham Cathedral was built. 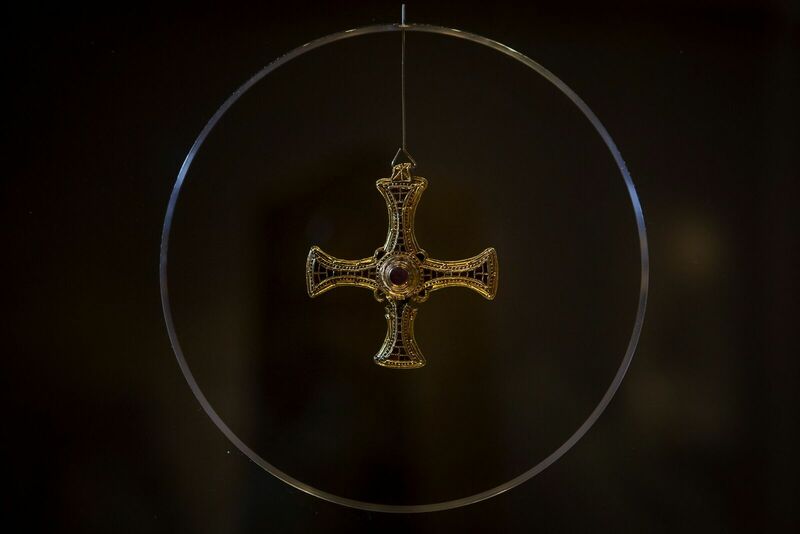 St Cuthbert’s pectoral cross, a 7th century gold and garnet cross designed to be worn on a chain around his neck. St Cuthbert’s portable altar, used to support his missionary work in the North East. It is believed to be the oldest surviving portable altar, dating from 660AD. The original Sanctuary door knocker, dating from the 12th Century, and one of Durham’s most enduring symbols. Originally attached to the North Door of Durham Cathedral, those who had committed a crime could rap on the door knocker and be given 37 days of sanctuary, during which time they could reconcile with their enemies, or plan their escape. The Treasures of St Cuthbert are now on permanent display within Open Treasure in the Great Kitchen, one of only two surviving medieval monastic kitchens in the UK. Tickets cost from £2.50 – £7.50, and are available online and from the visitor desk at Durham Cathedral. For more information visit www.durhamcathedral.co.uk, or telephone 0191 386 4266.